On Friday afternoon, March 11, 2011, Kosuke Heki was in his office in Hokkaido University in northern Japan when the ground began to shake. The pulses were far apart, and each one lasted a few seconds. 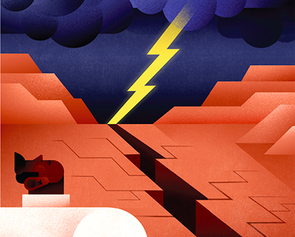 Heki, a geophysicist who studies an arcane phenomenon involving odd patterns formed by electrons in the sky after quakes, was interested but not unduly alarmed. It seemed like a large earthquake but far away. As the shaking continued, he thought perhaps data from the event might help his research. Then someone flipped on the news, and Heki’s curiosity turned to horror. The waves he felt had come from the biggest temblor in modern Japanese history—the devastating magnitude 9.0 Tōhoku earthquake, which cost the country hundreds of billions of dollars and claimed more than 15,000 of his compatriots’ lives. The tsunami after the quake crippled the Fukushima Daiichi Nuclear Power Plant and triggered the worst nuclear disaster in a quarter of a century. While emergency personnel worked to evacuate people and save lives in another part of the country, Heki could only wait for spotty phone and Internet service to come back online. By Sunday, the Internet was working, and he quickly downloaded satellite observations of the air over the region of Tōhoku and hungrily combed through them. As he expected, electrons in the ionosphere showed a disturbance 10 minutes after the quake. But he could not get his model to fit the data by just looking at the minutes after the quake. So he tried expanding the time frame, including the hour before. That is when he saw something that stopped him in his tracks. Forty minutes before the earthquake struck, there was a subtle rise in electron density above the temblor’s epicenter. Maybe it was an anomaly, a one-off or an instrument malfunction. Or maybe it was something more. Scientists have yet to find a reliable earthquake precursor—a telltale sign that could alert people before the onset of a large quake. If electron changes were such a warning, they could save thousands of lives a year. Heki, whom colleagues describe as unassuming, quiet and cautious, was immediately skeptical of his own data, so he pulled up information from two other earthquakes. He saw the density change again and decided to keep digging. To date, he has found the electron signal before 18 big quakes, and over the past seven years he has come to believe it is real. Heki’s idea seems to be sticking around, however, and may be getting stronger. The electron signal has shown up in medium-sized quakes as well as the largest ones. Other scientists have formed a theory that connects faults in the ground to activity in the sky. Heki has published his findings in reputable journals such as Geophysical Research Letters and been invited to lecture about the results at the American Geophysical Union’s annual meeting. This past spring Japan’s Chiba University hosted an entire meeting to debate quake prediction, including his idea. If Heki is right, the implications for public safety are enormous, but there are difficult questions about how to use such a precursor. How accurate must a warning system be to sound an alarm, and what kind of emergency response should ensue? Charles F. Richter—creator of the quake magnitude scale that carries his name—is said to have remarked that “only fools and charlatans predict earthquakes.” But that hasn’t stopped people from trying. In 373 B.C., animals reportedly ran for shelter five days before an estimated 6.0 to 6.7 magnitude temblor rocked Greece and destroyed the city of Helike. The Japanese once thought that twitching or thrashing catfish could predict earthquakes. Dogs, sheep, centipedes, cow’s milk and a Sumatran pheasant called the great argus have all been said to change their behavior before a quake. Others have looked at wells that suddenly go dry, temperature changes, radon gas emissions and, of course, groups of smaller foreshocks as possible precursors. In 1975, using a combination of these signs (including animal behavior), the Chinese even managed to predict a 7.3 quake early enough to begin evacuating the city of Haicheng. It raised hopes. “In the 1970s American and Japanese seismologists became pretty optimistic about short-term earthquake prediction,” says Masao Nakatani, an expert in rock mechanics at the University of Tokyo. “We tended to believe that earthquakes must be predictable.” By the 1980s both the U.S. and Japan had created research groups to pursue the challenge.